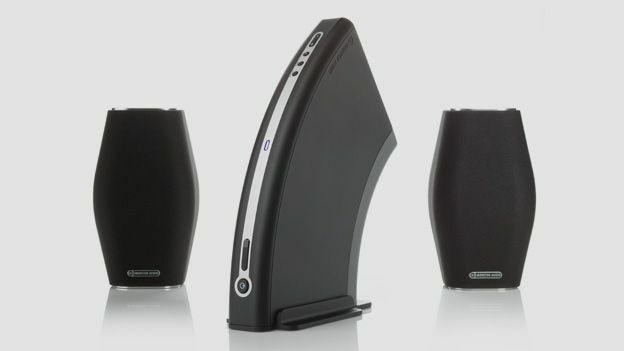 The brains of this outfit is the Monitor Audio A100 amplifier, for inside its banana-like casing is a wireless receiver that can stream from your iPhone via AirPlay or any DLNA music player over Wi-Fi, while offering connections for your less mobile devices. And with a decent DAC and 50W p/c amplification it has audiophile pretensions. Think of it as bridging the gap between hi-fi and Wi-Fi. Lay it on its back and it even looks like a bridge - kind of. What is certain is that this blend of features and connections makes the MA100 more flexible than such wireless wonders as the Sonos BRIDGE and Denon Ceol systems and outperforms streamers like the Sony CMT-SBT100B. The MA100 system comprises the AirStream A100 amplifier and a pair of MASS 10 speakers, but it's all available individually and there's an optional subwoofer too. In an attempt not to look like a set-top box, the A100 sports a pronounced curve that's not so impractical as it appears because stood upright on the supplied stand, it makes a mighty fine bookend. It will stack on top of your hi-fi just as readily and comes in a choice of black or white finishes. The casing, which measures 33cm x 9.2cm x 26.9cm (WxHxD) is largely metal, so it feels robust and it's full of class A/B amplification giving a hefty weight of 1.9kg. The MASS 10 satellite is a compact diamond-shaped two-way speaker measuring 124cm x 128cm x 128cm (WxHxD) and weighing 1.65g. It seems well designed and well put together with brushed steel plates covering stout cable connectors that channel your cables behind the speaker. Like the Sonos Bridge, the A100 contains stereo amplification, a DAC to convert your digital sources, analogue and digital inputs and a Wi-Fi transmitter. What the AirStream also offers, importantly, is both AirPlay and DLNA streaming, so you can connect iOS and Android devices via your home network. You have the option of making a direct wireless connection between devices, but you're not limited to it. Aside from channelling your various inputs, features are thin on the ground. There are no sound modes for example, just volume up and down. A little leaf-shaped remote control takes care of this. Rear panel connections are sparse. There's no Ethernet port for example, so your home network needs to be reasonably robust to avoid dropouts. You have analogue inputs for perhaps a turntable, provided you bring your own phono stage, and analogue outputs for adding a subwoower as required, but just one optical digital input, with which your TV/Blu-ray/console will have to take turns. The biggest surprise/disappointment is the single USB port at the front. It will only recognise iOS devices. Android phones, USB thumb drives etc are simply ignored. Wireless connectivity, however, is more inclusive. With AirPlay and DLNA our iPhone and Samsung Galaxy Note 3 both joined the wireless party with little fuss (one at a time of course). That USB port can be used to quickly setup a wireless link with your iDevice and the Android phone simply jumped aboard in one click. Monitor Audio is a British hi-fi brand of some repute, and audio quality is cleary a priority for the MA100 system. Instead of crummy spring clips to clasp your speaker cable, there are solid binding posts for 4mm banana plugs on the A100 amp and MASS speaker. The stereo amp is a potent 50wpc and the internal DAC is audiophile quality. It all adds up to a big sonic performance from small boxes. Place the satellites about six feet apart and you get great stereo imaging and a sound that fills a large room with detailed sound. Assuming you're playing decent-quality downloads or high-resolution rips, the treble rings out clearly, vocals sound well rounded and basslines are snappy and tight. One thing that's missing is bottom-end bass and these satellites could really do with a little help from a subwoofer like Monitor Audio's own MASS W200. We also tried connecting the A100 to a pair of Monitor Audio Studio 12 floorstanders and were surprised to hear them sing quite happily. It didn't solve the missing bass issue as the 12's prefer a little more power, but it proves that you can use your own full range speakers. If you're looking for a sleek wireless hi-fi that can access your online playlists from your phone, there are many to choose from, but the Monitor Audio MA100 has the flexibility to flip between iOS, Android, analogue and digital devices with ease and the quality to do each one justice.